« Day 176 in Beijing: I. Want. This. Car. Day 177 in Beijing: Where did all the 4s go? It looks like pretty much any elevator. Notice a lack of “4” on the elevator. And 13. 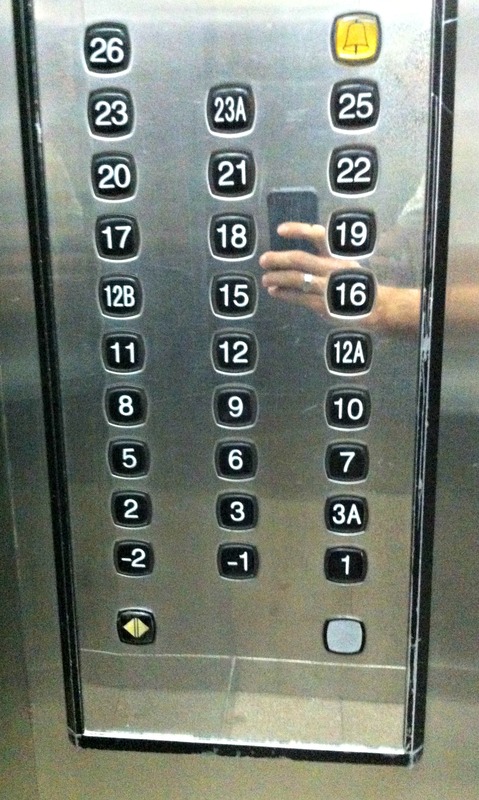 However, it seems to miss a lot of floors. Actually, it doesn’t miss any floors. It misses a lot of FOURS. That is because four is an unlucky number in Chinese mythology. A perfect example of this is when I bought my cell phone number. I was supposed to pay 40RMB for it (about 6 USD). I was able to choose from around 50 numbers. The number I choose happened to have a lot of fours in it and that made it easy to remember. And yet, there is a 4 on the LED screen. When I picked it, the rep told me that I would get it free because of the fours in it and most Chinese people won’t buy it. In fact, it would have cost a lot more if my number had an “8” in it as that is supposedly a very lucky number here. The rep then told me that I’d get a 10RMB discount, each month, for that number as an incentive. I was going to take it anyway but because it had fours in it, I got it free and got a discount. So, check out the pictures of my elevator. Instead, they changed the name to 3A, 12A, 12B, and 23A. 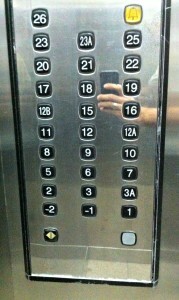 If you notice, there is a 12A and 12B. That is because the Western superstition of the number “13” has now been imported to China. The further you travel, the smaller the world becomes.